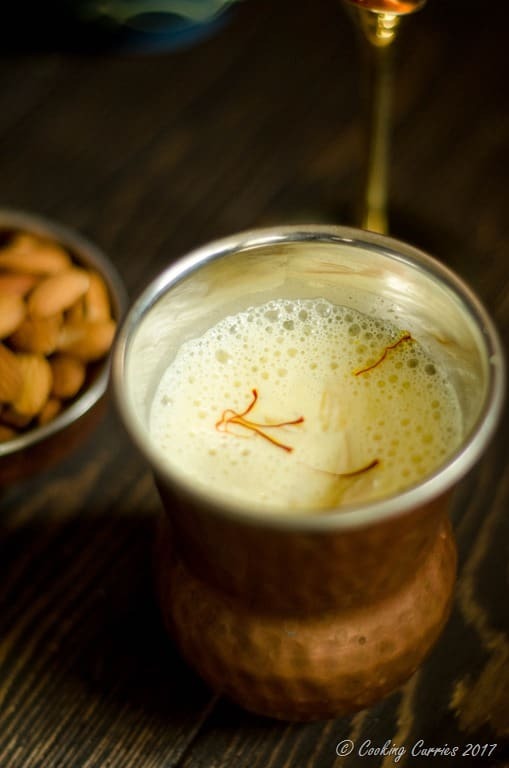 Warm creamy whole milk infused with the goodness of almonds along with fragrant saffron and cardamom in this Kesar Badam Doodh is a fitting welcome drink for your guests at your next festival get together. 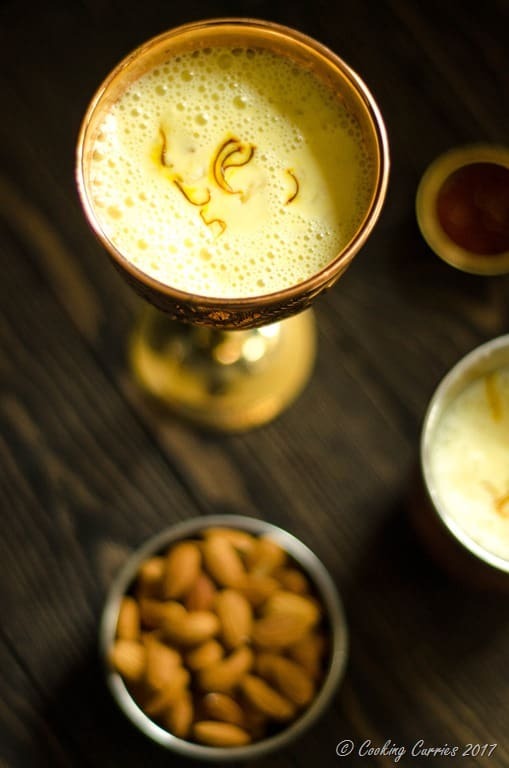 Kesar is Saffron, Badam is Almonds and Doodh is Milk. 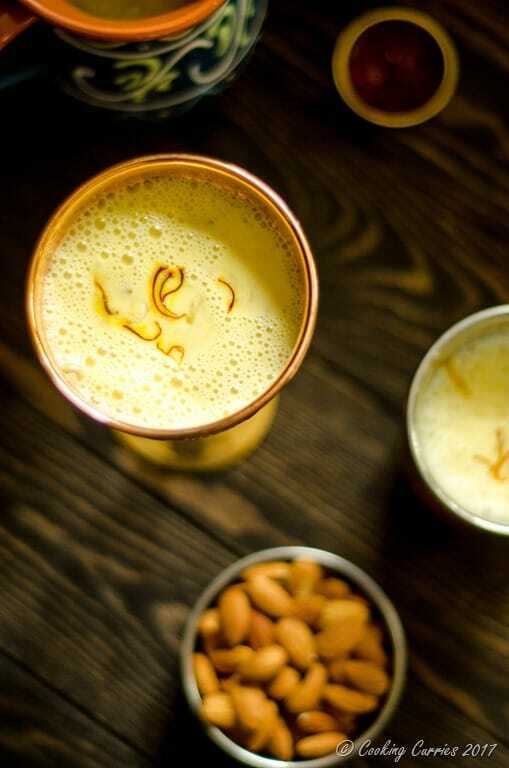 So this Kesar Badam Doodh literally translates to Saffron Almond Milk. A glass of this warm, frothy concoction is enough to take you some place warm and fuzzy and cozy. If you look at any Indian / ethnic stores in your area, you will invariably find a mix for this Badam Milk, that all you need to do is mix with hot milk and you are all set. Well, this recipe, even though not as easy as add and mix, it is still a relatively easy recipe with most of the time taken in soaking the almonds to soften them and to be able to peel the skin off easily. Soak the almonds in hot water for 30 mins or so and peel off the skin (it just glides off easily at this point), grind to a fine paste and add to boiling milk, along with sugar, saffron and ground green cardamom. Its as easy as that. 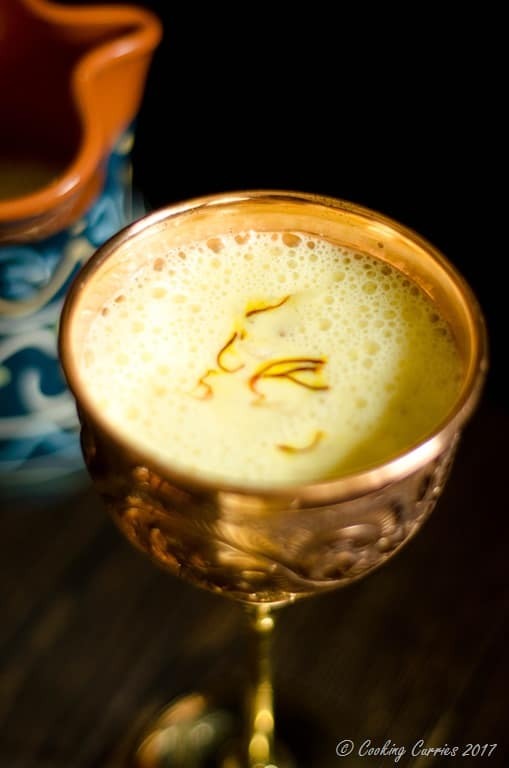 And you get a richly delicious drink of Kesar Badam Doodh, where you know exactly what went into it, rather than trusting a box of ingredients with preservative and what not in it. Also, this can be made in bulk and made in advance and as you saw, not a complicated or convoluted recipe, so there is no reason to make this and serve yourself and your guests for this festive season! 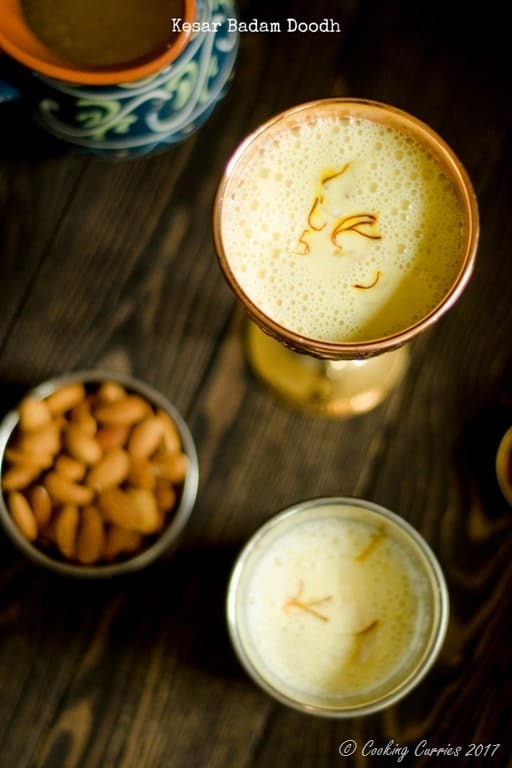 You could also try this Cardamom Rose Milk or Saffron Mango Lassi as well. Soak the almonds in hot water for about 20 mins or soak them in regular room temperature water overnight. Bring the milk to a boil along with the saffron and cardamom and let it simmer. Meanwhile, peel the almonds (just slide the skin off the almond and it should slip right through) and reserve about 10 almonds. Grind the rest to a very fine paste without adding any water. Add this almond paste to the simmering milk and let it cook for 4-5 mins in it. Keep the heat to medium-low and keep stirring it, so the milk does not stick to the bottom of the pan and burn. Meanwhile, slice the reserve 10 almonds and add them to the milk. Add sugar and stir till the sugar dissolves. Remove from heat and serve hot, warm or cold. Is it the (Amul?) cardamom milk that came in a glass bottle? I used to love that too!!! ?